Dog Pawsitive Tidbits: Pets and Animals and Humans Oh My! Pets and Animals and Humans Oh My! Sometimes pets, wild animals, and humans do not mix well! It has been a rough couple of weeks around the house, yard, and neighborhood of late with stray and feral cats roaming everywhere in sight. Several of these cats tried to take up residence under the house, screaming as if mating, all night after night. We fixed that problem by blocking all the entrances. Now the cats are running around on the deck by night and in the yard and all around the neighborhood by day. At wit's end, I turned that problem over to our local animal control. 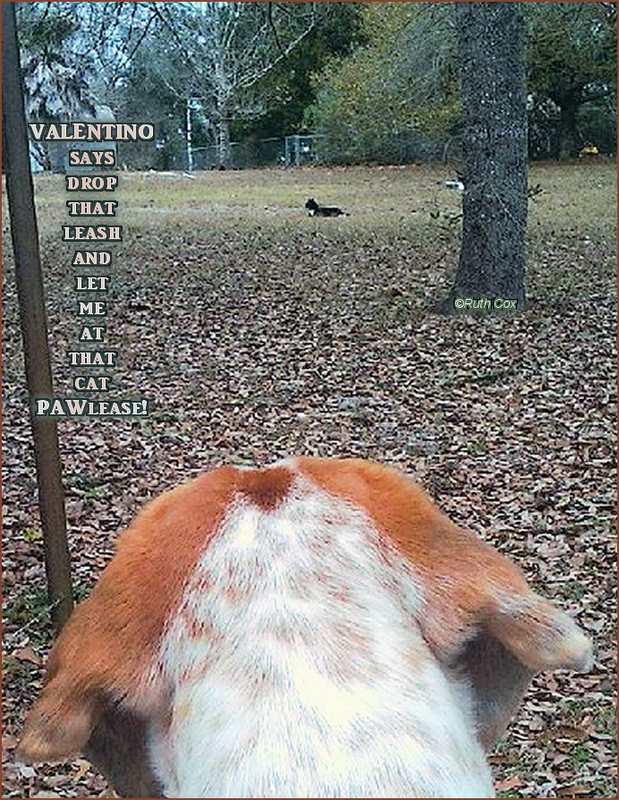 My dog Valentino spots stray cat in vacant lot across the street from our home. On our daily walks in our rural beach community (surrounded by forested areas) my dog and I dodge and deal with dogs off-leash, black bears, vultures, coyotes, and stray and feral cats — not to mention an array of waterbirds. We also must deal with a few neighbors who feed the wildlife, thus attracting them, which increases the danger to humans as well as the pets and animals. 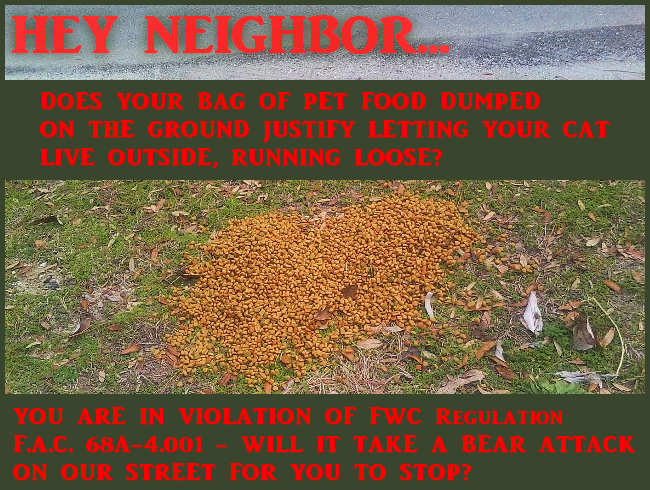 Bag of cat food found dumped along the street I live on. Again, I am pretty wordy today! Still, I am linking this article with pictures up with Wordless Wednesday at the Blog Paws community along with all the other pets and animals and their paw prints.